Only a few years ago LED lights were toys; you could buy simple on-camera home movie 9-LED Sima’s at Best Buy for $35.00. Today LED products from LitePanels and its competitors are found in major newsrooms like CNN, and in Hollywood studios for TV shows like “Desperate Housewives.” Several of LitePanels’ 8 major lines are designed to complement and replace large-scale tungsten and even less efficient half-K HMI lights. Even without diffusion LitePanels products feature a hallmark clean soft white glow lauded by many pro’s. Recently LitePanels sent me the Croma to play with. This is a lightweight fixed-flood junior softlight with extras, designed for news and event videographers and DSLR shooters. Compared to early models like their entry-level Micro, which had battery and filter holder issues (still offered and with improvements), the fit, finish and redesign of the Croma are apparent and welcome. Croma’s main attraction is its ability to mix alternating bands of LED hues to quickly create indoor or outdoor lighting balanced to existing light sources. It also makes a lovely spot fill light in studio work. At 6 feet in full daylight mode, it’ll throw over 9 footcandles / 98 lux with an even spread, flicker-free, better than a small tungsten unit with the inevitable hotspot. On the Croma, which is designed for on-camera or stand work, intensity is controlled by one knob, able to ramp from 100% to zero with no noticeable color shift, while the second knob lets you quickly dial in any color temperature mix between 56K (like sunlight) and 32K (like tungsten sources) on the fly, by eye. 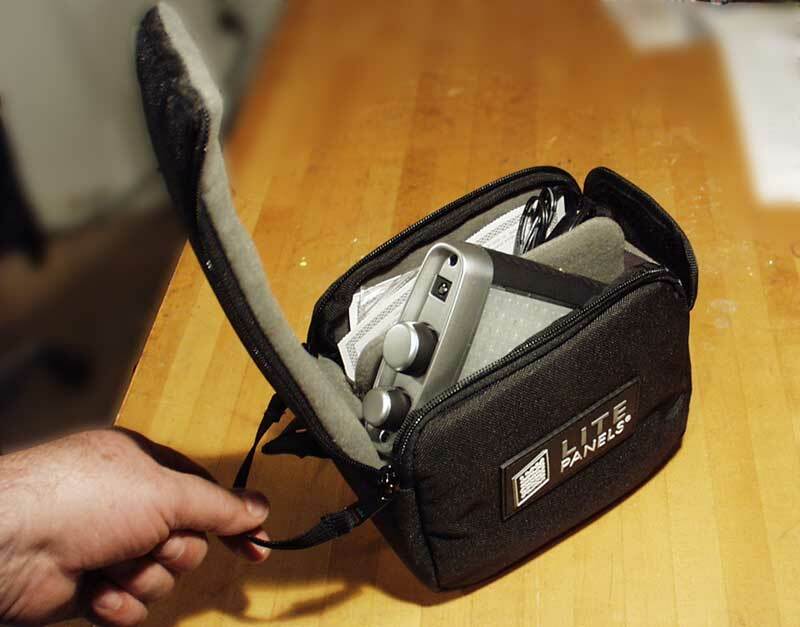 The kit comes with a solid, slide-in diffusion gel, a ball head socket with camera shoe, tripod screw receptacle in its base, an AC adapter -- this includes European travel adaptersall stored in handsome cushioned carrying case. If there’s anything to find fault with the Croma, it’s the same complaint of any open-face LED lightyou can’t place a kukaloris (“cookie”) in front of it to cast shadows, for instance, to break up solid wall backgrounds or suggest a location. I disovered this after laboriously carving up a slab of that stiff foam you get at the arts and crafts store. If you try using it, the result is a prismatic effect which obliterates the shadow. This is simply because LED sources are comprised of more than one light point you get the shadow cast from each LED in the entire array as it passes through the cookie! It does give a cool kind of digital effect which may be right for some interviews. And maybe not. Not all LED sources act this way; a Fresnel-lensed LED lamp is designed to redirect light of one or more sources into a strong beam, and acts the way any point source acts. 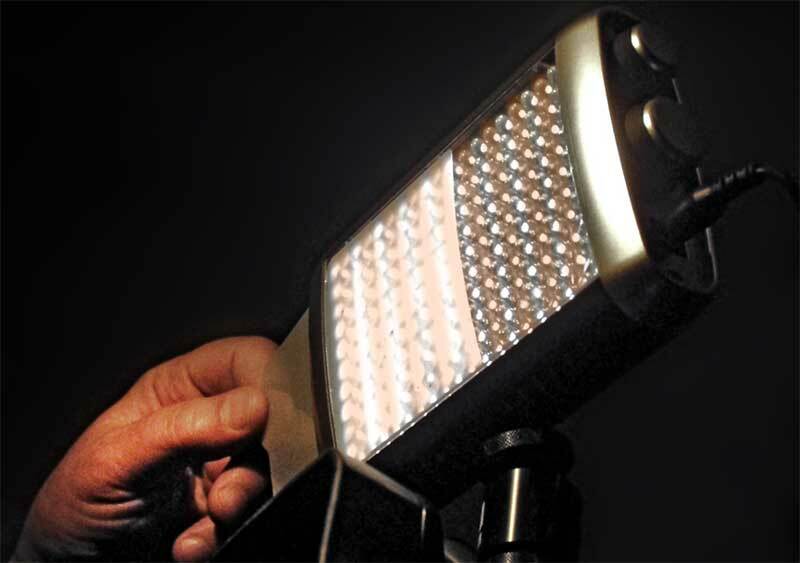 This is one reason why LitePanels has introduced a bevy of Fresnel-based lights. From lighthouses to LED’s! LitePanels also continues to expand their offering of open-face LED’seven an “Obie-like” item -- orginally designed for Merle Oberon by her cinematographer/husband Lucian BallardLitePanel’s version is the Ringlite series which encircles the lensas elegant a wrinkle demolisher as you can get. A Croma near the lens will do a similar job. 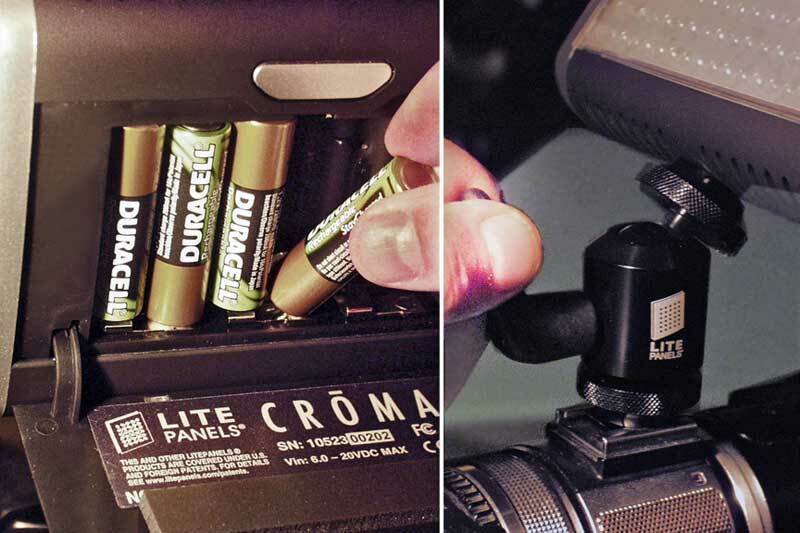 You can power your Croma four different ways: with the adapater; 6 AA alkaline or rechargeable batteries (lithium-ion cells can also be used but excessively heat up the unit, which will automatically shut it down when detected); add the optional D-tap power cable for sources such as Anton-Bauer packs; or you can piggyback on camera battery power with optional plates for Sony, Panasonic and Canon. As you’d expect from any cool tool, the Croma runs with practically no heat. Loren S. Miller, longtime reporter/member at LACPUG and BOSCPUG, is an Oscar-winning documentary editor working where he’s needed, who occasionally shoots. See some of his early camerawork along with edit and graphics samples, at YouTube, Neotrondesign channel. He is also developer of KeyGuides, available at the LACPUG Store. Reach him anytime at techpress@mindspring.com.